My name is Charlie Laing, and I’m both a director and the Construction Project Management Operations Director of CLPM Ltd. I live in beautiful rural Berkshire with my wife and our 3 teenage children, plus our 2 dogs, a whippet called Twix and Lester the greyhound. Coming from the Laing family, building is in my blood. So it probably comes as no surprise to hear that our home is a bit of a building site! 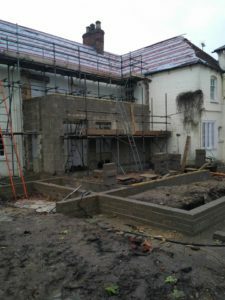 We live in an 18th century rectory which we bought last year as a project, and which we are now in the process of renovating. My alarm goes off each weekday morning at 6am. I’d like to think I’m a morning person (my wife might disagree!) so I’m generally happy to leap out of bed and start the day. 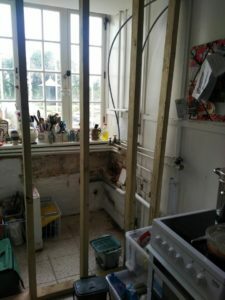 As you can see from the photo, our kitchen is in a state of disarray at the moment, as a result of the building works. My wife and I are experienced serial renovators however so we’re used to living in whilst we build. Thankfully our internet connection is still good however, so I pick my way through the general debris, grab a cup of tea with a bowl of muesli with yoghurt and start checking my work emails. My job means I spend much of my time out onsite with our project managers, as well as meeting with new and existing clients. With upwards of 30-40 building projects live at any one time, I like to plan and book my visits ahead. Although the nature of our business and the needs of our clients means I always aim to keep my diary as flexible as I can. CLPM work on residential and commercial construction projects across London and the South East, so I cover quite a lot of miles. I typically visit 3 clients a day and drive 700 miles plus each week in my Skoda Fabia. However, I believe passionately in sustainability, so I try to minimise my environmental impact by making my visits as energy and fuel efficient as possible. I often take the train and tube if I’m visiting London. I’m also boosting the energy efficiency of my home during its renovation – using high levels of insulation to its structure as well as running the heating system on a biomass wood pellet system. Lunchtime is generally squeezed in between appointments and so has to be portable. It’s therefore generally the British builder’s staple – sandwiches, but I try to eat healthily. My Operations Director role is two-fold. Firstly, I meet with and talk to potential new clients about what project management support they need for their upcoming renovation, extension or new build project. Secondly, I support our project managers, cost advice team and energy consultancy teams to help our existing clients throughout the duration of their building project. Initially I find our potential and new clients are mainly looking for reassurance and someone to help them plan, budget and understand the best approach to take for their building project. Once we start working with clients, I get involved with problem solving, and giving additional advice on how we might approach any issues. I also spend time assessing how we and the contractors are performing. In addition to frequent phonecalls, emails and meetings, we use an online construction management system called Buildertrend. This gives me, the project manager, the client and the rest of CLPM a great insight into the status of each individual project,. My tip for how to get the most out of your project manager is to treat him or her as a team member. Your project manager is there to help you to deliver your shared project goals. Sometimes we may challenge and query, but remember as independent project managers we always have the interests of our clients at the heart of what we do. I’m often asked what I most enjoy about working in construction project management. I’d say I never stop getting excited about seeing buildings go up. Sometimes overcoming the challenges we face together with our clients make the job even more satisfying. That’s the case whether we encounter particularly tight time constraints or issues with construction methodology. It’s never dull! I generally aim to finish work between 6 and 7pm each weekday. However as CLPM regularly attend shows like Build It Live and Grand Designs Live as Project Management Experts, I’m often out and about at the weekend – giving seminars etc. My hobbies include spending time with my family, playing squash, watching rugby (I support Leicester Tigers) and dog walking. I’m embarrassed to say that despite working for around 25 years in the construction industry I’m pretty hopeless at DIY. I’m not too bad at demolition though! 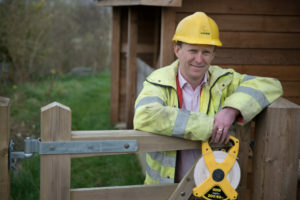 If you’d like to have a chat with me about your building project do get in touch. Fill out a contact form, email info@cl-pm.com or call 01923 896550.